Home / College Wrestling News / Dake officially presented Hodge in Ithaca, N.Y.
Dake officially presented Hodge in Ithaca, N.Y. I had a real privilege on Sunday, May 5, in Ithaca, N.Y. Representing WIN Magazine and Dan Hodge Trophy founder Mike Chapman, I joined Neil Duncan and Nick Gallo from Presenting Sponsor ASICS on the campus of Cornell University to present the 19th annual Dan Hodge Trophy to four-time NCAA champion Kyle Dake of Cornell. 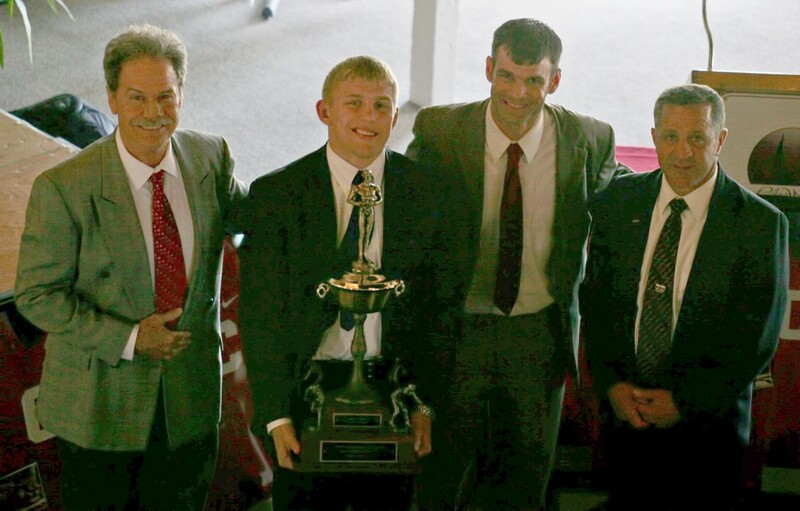 Kyle Dake (second from left) received the Hodge Trophy from WIN publisher Bryan Van Kley (second from right) and ASICS Neil Duncan (left) and Nick Gallo. As is the tradition with the Hodge Trophy presentation each spring, the award was presented publically at the team’s end-of-the-season wrestling banquet. Duncan and Gallo run TW Promotions, the Wrestling Agency for ASICS. The award was given in front of approximately 175 people at the Cornell banquet on that Sunday afternoon. Dake got 39 of 43 first-place ballots from the Hodge Trophy Voting Committee for wrestling’s top honor in late March. Commonly referred to as the “Heisman Trophy of College Wrestling”, Dake won the award over Penn State’s Ed Ruth, Oklahoma State’s Jordan Oliver and Ohio State’s Logan Stieber. Ruth, Oliver and Stieber finished second through fourth, respectively, in the balloting in total points. The two-time NCAA champ from Penn State received the other four first-place votes. Duncan addressed the Big Red supporters first during the Hodge presentation. He stressed to the crowd the significance of Dake’s four titles at four different weights, referring to the unique wrestling record as one he thought would never be matched again in college wrestling. Gallo, named OW at the NCAA Championships in 1977 while competing for Hofstra, got the crowd laughing by saying he was just happy Dake wasn’t in his weight class. I then followed up Duncan and Gallo by reminding the roomful of Dake fans, coaches, teammates and family members that sometimes you don’t recognize true “greatness” as much as you should when you’re so close to it. Dake, who grew up just minutes down the road in Ithaca, where he graduated from Lansing High School, gave them and all of wrestling a front-row seat to history by being so available to the media and his fans. He also did this by being transparent in regards to his perspective on pursuing history and the record fourth title. I stressed that in sports like wrestling, which doesn’t get as much main-stream media coverage, elite wrestlers like Dake don’t get the recognition that they would as if they were the star quarterback of a big-time college football program which had numerous national media chronicling his story. I ended the short speech before announcing Dake as the winner by referencing a quote from the 2004 movie “Troy” about arguably the most famous warrior of all time, Achilles, played by Brad Pitt. Dake was able to reel off the four titles through sheer determination, goal setting and an “exclusively positive mindset” he got from his parents early in childhood and by simply wanting it more than anyone else. It was an incredibly memorable trip. Leaving the unseasonably late snowfall in central Iowa, it also was a beautiful weekend, weather wise, in up-state New York. And seeing Cornell’s multi-million dollar wrestling-only Friedman Wrestling Center, it was obvious I was in an area and at a school which highly valued wrestling. Nestled into the New York hills overlooking a lake, this Ivy League school, which now has a very strong wrestling tradition, has quite a product to sell top recruits. But the fundraising to create the Friedman Center, the groundswell of support and the program’s strong reputation of success on the mat, is mostly tied to the momentum created by head coach Rob Koll. The Big Red head man just finished his 20th season as the program’s coach. Gallo, Duncan and myself left Ithaca after hearing the speeches of the team and coaches sensing what a family atmosphere has been developed. The wrestlers and coaches were constantly giving each other a hard time, and seem to really enjoy being around each. Several said wrestling for Cornell was the highlight of their life. It was truly an enjoyable weekend, and fun to be at a place where wrestling is so truly alive and well. I left there with a renewed sense of optimism that with strong leadership, wrestling can thrive almost anywhere.